"Highway 66. 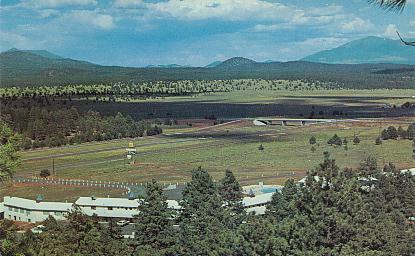 Flagstaff, Arizona". 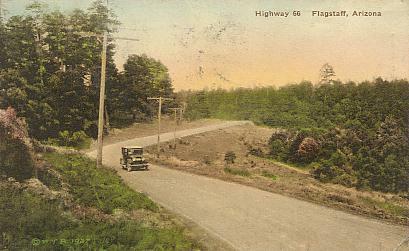 Hand-color printed postcard. Published by Robertson's News Stand, Flagstaff, Arizona. Printed by The Albertype Co., Brookly, N. Y. Published circa late 1920s. Postmarked 1934. "San Francisco Peaks. Highest point in Arizona. U.S. 66". Real photo postcard. Published by Frashers Fotos, Pomona, Calif. Unused. Circa 1940s. "San Francisco Peaks. From Highway 66. Arizona". Real photo postcard. Publisher not given. Postmarked 1947. "San Francisco Peaks. 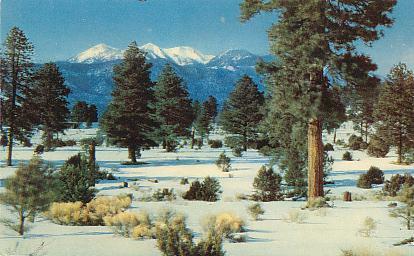 The highest points in Arizona, these famous peaks are seen in winter dress from U. S. Highway 66 near Flagstaff". Color chrome-style printed postcard. Published by Bob Petley, Phoenix, Arizona. Number K160. Unused. Circa 1950s. 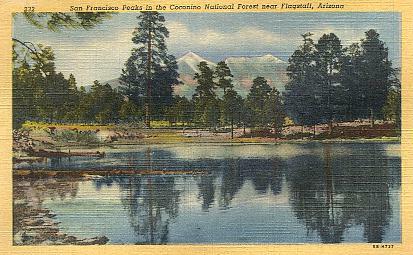 "San Francisco Peaks in the Coconino National Forest near Flagstaff, Arizona. ...". Color linen-texture printed postcard. Published by Lollesgard Specialty Co., Tucson, Arizona. Printed by Curteich, Chicago. Number 5B-H737. Number 232. Unused. 1945. 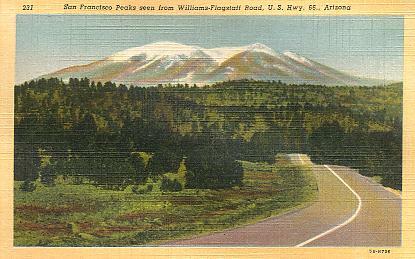 "San Francisco Peaks seen from Williams-Flagstaff Road, U.S. Hwy. 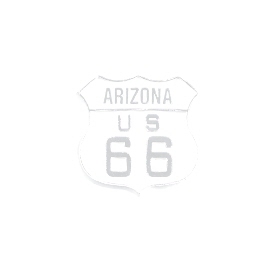 66, Arizona. ...". Color linen-texture printed postcard. Published by Lollesgard Specialty Co., Tucson, Arizona. Printed by Curteich, Chicago. Number 5B-H736. Number 231. Unused. 1945. "Snow-covered San Francisco Peaks. ...on Route 66 near Flagstaff, Arizona". Color chrome-style printed postcard. Published by Bob Petley, Phoenix, Arizona. Number K54. Postmarked 1951. 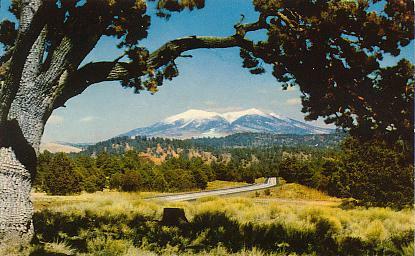 "San Francisco Peaks, 12,611 feet elevation, dominate the the skyline in northern Arizona. 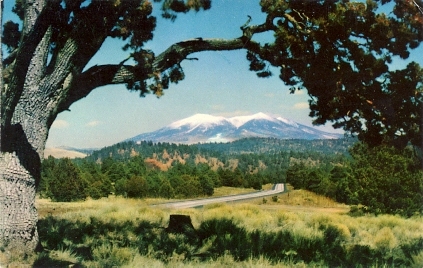 Viewed here from U. S. Highway 66 between Flagstaff and Williams". Color chrome-style printed postcard. Published by Union Oil Company. Unused. Published 1955. "Greetings from northern Arizona. Snow-covered San Francisco Peaks. ...on Route 66 near Flagstaff, Arizona". Color chrome-style printed postcard. Published by Petley Studios, Phoenix, Arizona. Number 8CK3123. Unused. Published 1958. "U. S. Highway 66 crossing Arizona. 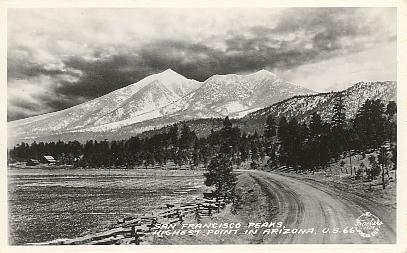 ...the San Francisco Peaks as seen between Flagstaff and Williams, ...". Color chrome-style printed postcard. 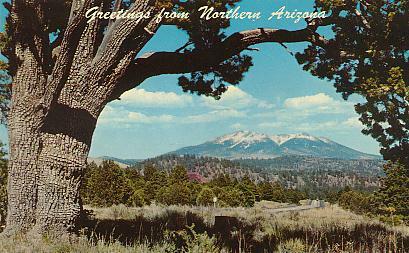 Published by R. Fronske, Flagstaff, Ariz. Printed by H. S. Crocker, San Francisco, Calif. Number RMF-9. Unused. Circa late 1950s. 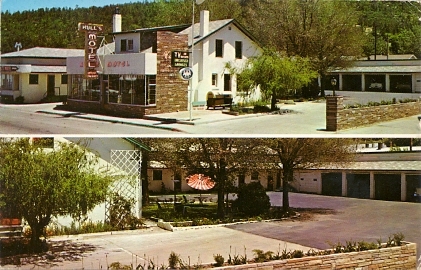 "Ponderosa Inn. 8 miles east of Williams, Arizona, on U.S. 66, Interstate 40,...". Color chrome-style printed postcard. Published by Bradshaw Color Studios, Sedona, Ariz. Number ICS-103763-1. Unused. Circa late 1960s. 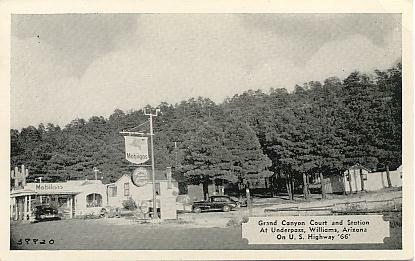 "Approaching Grand Canyon Junction on U. S. Hwy. 66, east of Williams, Arizona". Real photo postcard. Published by Lollesgard Specialty Co., Tucson, Arizona. Printed by Frashers Fotos. Number X710. Unused. Circa 1940s. 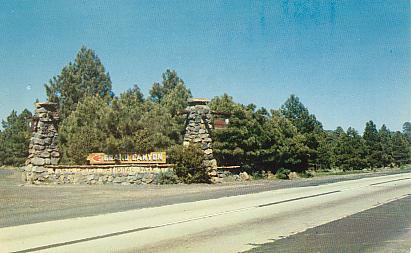 "Gateway to Grand Canyon". Real photo postcard. Publisher not given. Number 276. Unused. Circa 1940s. 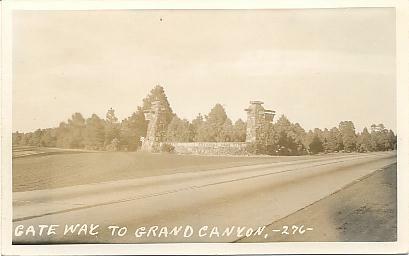 "The Grand Canyon National Park Highway junction with U.S. 66, two miles east of Williams, Arizona. ...". Color chrome-style printed postcard. Published by Petley Studios, Phoenix, Arizona. Number S1000-1. Unused. Circa 1950s. "Gateway to Grand Canyon National Park. On U. S. Hwy. 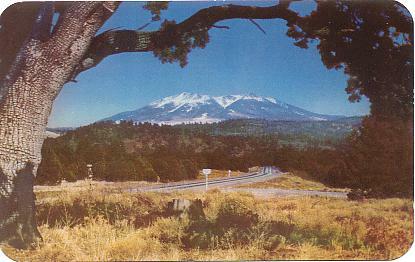 66 between Flagstaff and Williams, Arizona". Color chrome-style printed postcard. Published by Lollesgard Specialty Co., Tucson, Arizona. Number L450. Postmarked 1958. 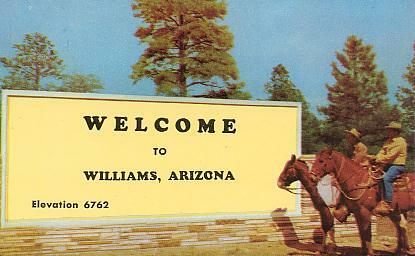 "Greetings from Williams, Ariz. ...Located on Highway 66 near its junction with the Grand Canyon Highway, ...". Color linen-texture printed postcard. Published by Lollesgard Specialty Co., Tucson, Arizona. Printed by Curteich, Chicago. Number 0B-H646. Number W-1. Unused. 1940. 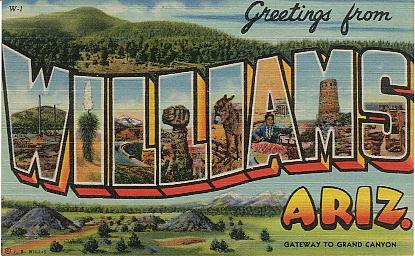 "Howdy from Williams, Arizona. ...". Color chrome-style printed postcard. Published by Bob Petley, Phoenix, Arizona. Unused. Circa 1950s. "Welcome to Williams, Arizona. Elevation 6762". Color chrome-style printed postcard. Published by Bob Petley, Phoenix, Arizona. Number K267A. Unused. Circa 1950s. 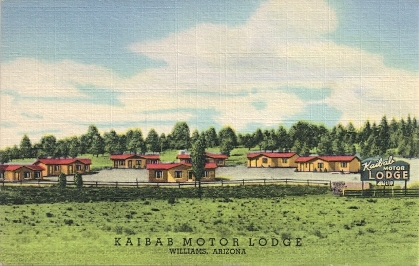 "Kaibab Motor Lodge, Williams, Arizona, on U. S. Highways 66 and 89, 1/2 mile east of town at the gateway to the Grand Canyon ...". Color linen-texture printed postcard. Published by Curteich, Chicago. Postmarked 1951. 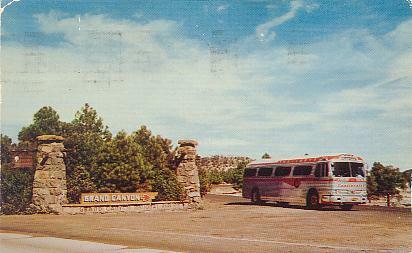 "Grand Canyon Court and Station. At underpass, Williams, Arizona, on U. S. Highway '66'". Black & white chrome-style printed postcard. Published by Baldwin's, Las Vegas, Nevada. Printed by Dexter Press, Pearl River, N. Y. Number 38820. Unused. Circa late 1940s. 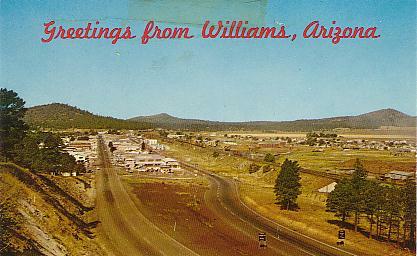 "Greetings from Williams, Arizona. Gateway to the Grand Canyon. ...". Color chrome-style printed postcard. Published by Fronske Studio, Flagstaff, Ariz. Printed by H. S. Crocker Co., Oklahoma City, Okla. Number RMF-130. Unused. Circa 1950s. [View shows U. S. 66 east side of Williams]. 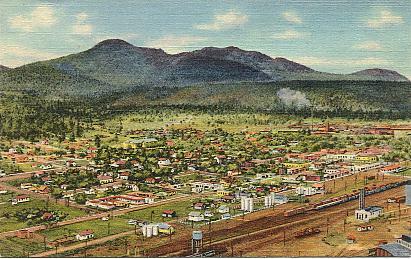 "Aerial view of Williams, Arizona. Showing Highway 66 east and west and Bill Williams Mountain...". Color chrome-style printed postcard. Published by Petley Studios, Phoenix, Arizona. Number S1611. Number K-508. Unused. Circa 1950s. 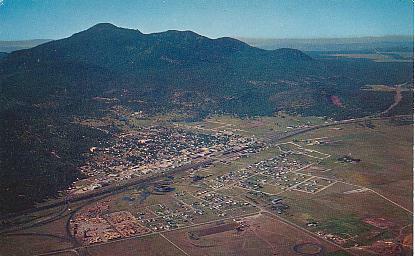 "Air view of Bill Williams Mtn. and Williams, Arizona. ...along the beautiful scenic drive east or west on Hi-way "66". ...". Color linen-texture printed postcard. Published by Lollesgard Specialty Co., Tucson, Arizona. Printed by Curteich, Chicago. Number 1B-H742. Number 265. Unused. 1941. [U. S. 66 is the second road above and paralleling the railroad track]. "Williams, Arizona. ...". Color chrome-style printed postcard. Published by Roben Co., Sedona, Ariz. Number ICS-59607. Unused. Circa late 1960s. Date of "Aug. 73" written on back. 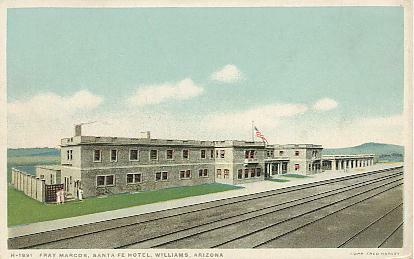 [The Santa Fe station and hotel may be seen on the upper center]. 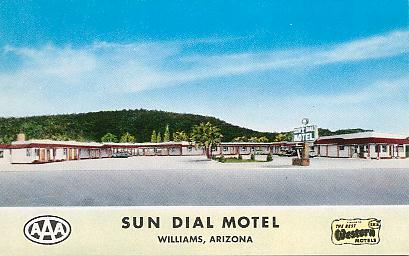 "Sun Dial Motel. On U.S. 66 and 89, Williams, Arizona". Color chrome-style printed postcard. Published by MWM Co., Aurora, Mo. Number 20,124F. Unused. Circa 1950s. "Thunderbird Inn. ...in Williams, Ariz., ...on Hiway 66. ...". Color chrome-style printed postcard. Published by Petley Studios, Phoenix, Arizona. Number S8256-1. Unused. Circa late 1950s. "Thunderbird Inn. 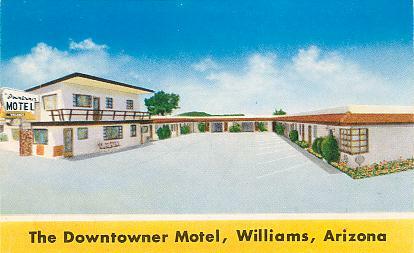 642 E. Bill Williams, Williams, Arizona, east end of town. ...". Color chrome-style printed postcard. Published by Petley Studios, Phoenix, Arizona. Number 37927. Postmarked 1959. Here is a matchbook from the same inn! 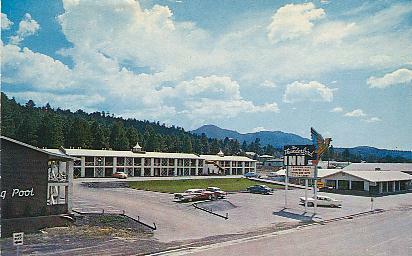 "El Coronado Motel. ...U.S. Highways 66-89 & 64, Williams, Arizona. ...". Color chrome-style printed postcard. Published by Douglas R. Smith Co., Washington, D. C. Printed by Tichnor. Number G89815. Unused. Circa 1950s. 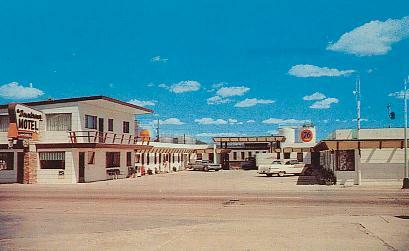 "El Coronado Motel. ...Williams, Arizona, on U.S. Highways 66, 89 and 64. ...3 blocks from post office, ...". Color chrome-style printed postcard. Published by Alfred McGarr Adv. 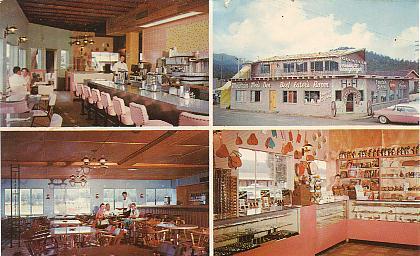 Serv., Albuquerque, N. M. Number 1153. Number ASK-450. Unused. Circa late 1950s. 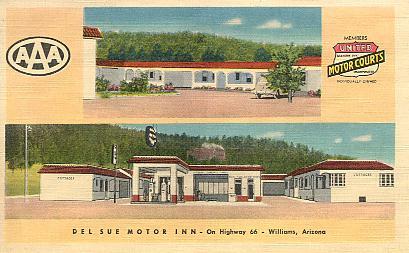 "Del Sue Motor Inn. On Highway 66 and 89, Williams. ...". Color linen-texture printed postcard. Published by MWM, Aurora, Mo. Number A-1742. Unused. Date of "Aug. 1, 1941" written on back. 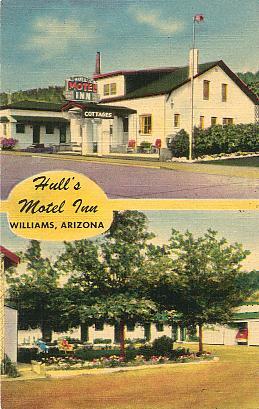 "Hull's Motel Inn. One block east of center of town, Williams, Arizona. ...". Color linen-texture printed postcard. Published by MWM, Aurora, Mo. Number 10,888. Unused. Circa 1940's. "Hull's Motel. 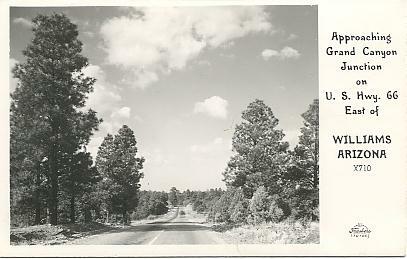 U. S. 66-89, Williams, Arizona, ...Gate way to Grand Canyon". Color chrome-style printed postcard. Published by Ohoenix Spec. Adv. Co., Phoenix, Ariz. Number 12264. Postmarked 1960. 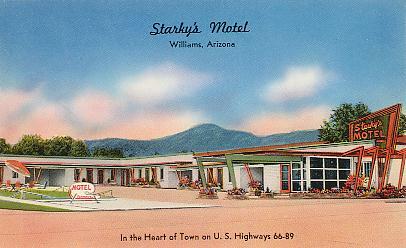 "Starky's Motel. ...located in Williams, Arizona, ...Excellent cafes and service stations within one block. ...". Color chrome-style printed postcard. Published by Alfred McGarr Adv. Ser., Albuquerque, N. M. Printed by Tichnor. Number G88234. Number ATG-362. Unused. Circa 1950s. 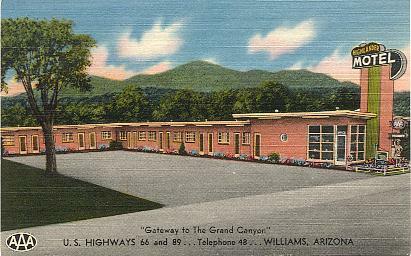 "Williams Motel. 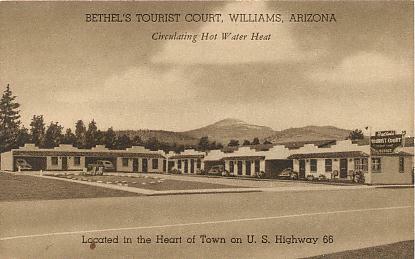 ...U.S. 66 - 89, Williams, Arizona". Color linen-texture printed postcard. Published by Colourpicture, Boston, Mass. Number K3732. Postally unused. Circa 1940s. "The Downtowner Motel. On U. S. 66 and 89, Williams, Arizona. ...". Color chrome-style printed postcard. Published by MWM Co., Aurora, Mo. Number 20,125F. Unused. Circa early 1950s. "The Downtowner Motel. Williams, Arizona. ...On U. S. 66 and 89. ...". Black & white chrome-style printed postcard. 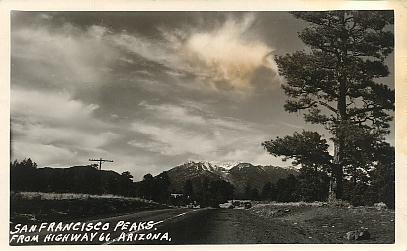 Published by Fronske, Flagstaff, Ariz. Printed by Nationwide Post Card Co., Arlington, Texas. Number 45. Unused. Circa 1950s. 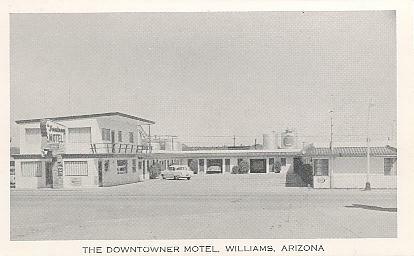 "The Downtowner Motel. 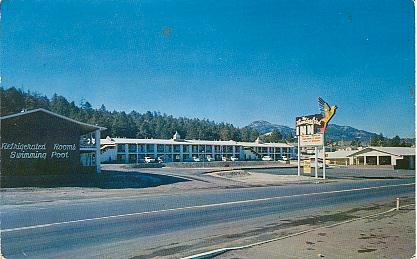 U. S. 66-89, Williams, Arizona. ...". Color chrome-style printed postcard. Published by Williams Photo Supply, Williams, Arizona. Printed by Dexter, West Nyack, N. Y. Number 25977-B. Unused. Circa late 1950s. "Fray Marcos, Santa Fe Hotel. Williams, Arizona". Color printed postcard. Published by Fred Harvey. Printed by Detroit Publishing Co. Number H-1891. Unused. Circa 1920s. 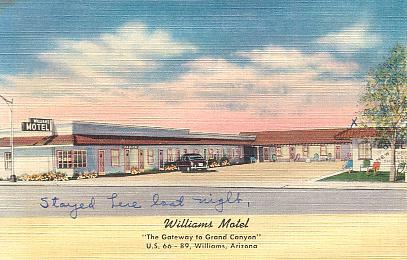 "Williams, Arizona, Hwy. 66. ...". Color chrome-style printed postcard. Published by Bradshaw's Photo Shop, Sedona, Ariz. Printed by Dexter Press, West Nyack, N. Y. Number 91819. Unused. Circa 1950s. [Notice the "66 Auto Supply" on the left side of the street]. 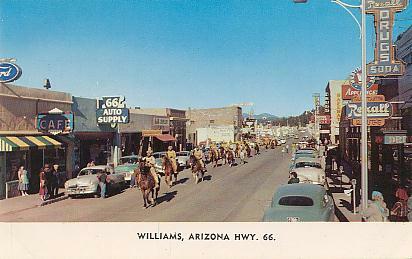 "Front Street, Highway 66, of Williams, Arizona, ...". Color chrome-style printed postcard. Published by Fronske, Flagstaff, Ariz. Printed by H. S. Crocker, San Francisco, Calif. Number RMF-8. Unused. Circa 1950s. "Mt. 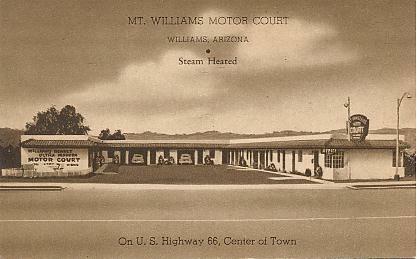 Williams Motor Court. 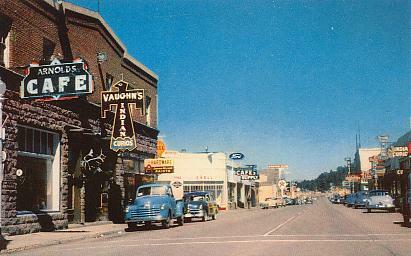 Williams, Arizona, on U.S. Highway 66, center of town". Brown printed postcard. Published by Associate Service, Pasadena, Calif. Number 89820. Unused. Circa 1940s. 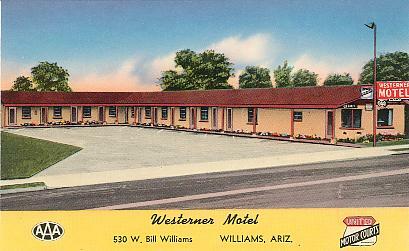 "Westerner Motel. 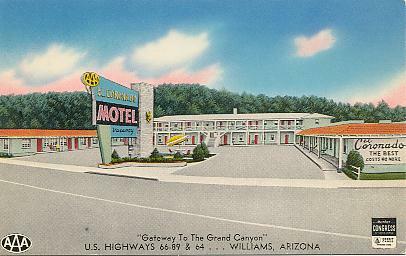 530 W. Bill Williams, Williams, Ariz. ...On U. S. 66 & 89, ...". Color chrome-style printed postcard. Published by Tichnor Bros., Boston, Mass. Number G87113. Unused. Circa 1950s. "Bethel's Tourist Court. 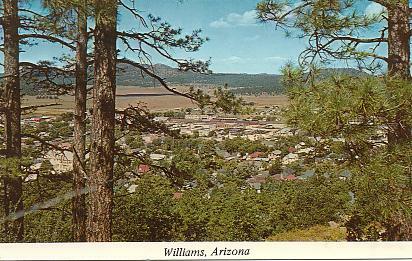 Williams, Arizona, located in the heart of town on U. S. Highway 66". Brown printed postcard. Published by Associate Service, Pasadena, Calif. Number 74214. Unused. Circa 1940s. "Williams Cheshire Motors. Williams, Arizona, on Highway 66. ...". Color chrome-style printed postcard. Published by Douglas R. Smith Co., Washington, D. C. Number 41660. Unused. Circa 1940s. 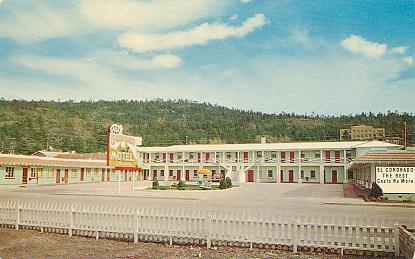 "Highlander Motel. U.S. Highways 66 & 89, Williams, Arizona". Color linen-texture printed postcard. Published by Baldwin's, Las Vegas, Nevada. Printed by Dexter Press, Pearl River, N. Y. Number 89820. Unused. Circa late 1940s. 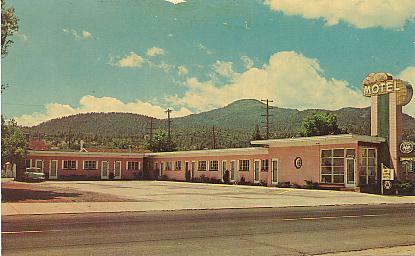 "Highlander Motel. U.S. Highways 66 & 89, Williams, Arizona". Color chrome-style printed postcard. 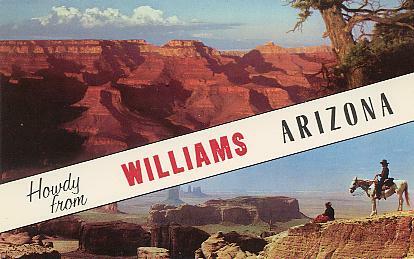 Published by Williams Photo Supply, Williams, Ariz. Printed by Dexter Press, West Nyack, New York. Number 79381-B. Unused. Circa 1950s. 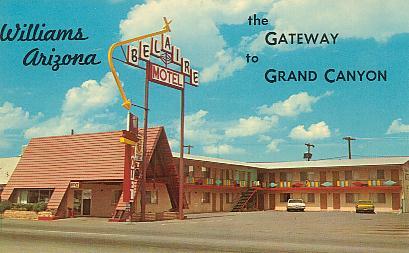 "Belaire Motel. ...West Highway 66, Williams, Arizona. ...". Color chrome-style printed postcard. Published by Williams Photo Supply, Williams, Ariz. Printed by Dexter Press, West Nyack, New York. Number 68195-C. Unused. Circa late 1960s. 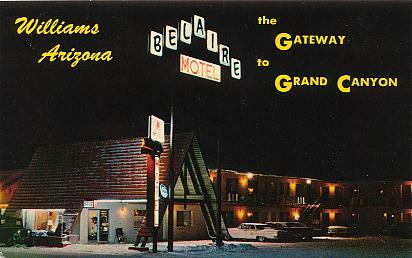 "Belaire Motel. ...West Highway 66, Williams, Arizona. ...". Color chrome-style printed postcard. Published by Tichnor Bros., Boston, Mass. Number K-17482. Unused. Circa 1960s. 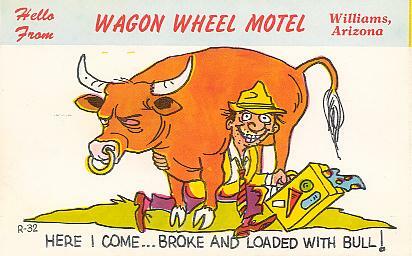 "Hello from Wagon Wheel Motel. Williams, Arizona". Color chrome-style printed postcard. Published by Baxtone, Amarillo, Texas. Number R-32. Unused. Circa 1950s. "Harvey's Hacienda. 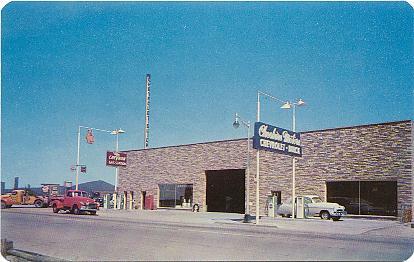 West end, Williams, Arizona, Hiway 66. ...". Color chrome-style printed postcard. Published by Phoenix Specialty Company, Phoenix, Arizona. Number 3014B. Unused. Circa 1950s.